We adore hearing from our customers! These families share what they love about Goodfood and how they have made it a part of their lives! Read on for their stories. How do I love Goodfood?! Let me count the ways.. 😉 Not only has this company ticked all of the boxes when it comes to easy meal planning, convenience, innovative recipes and food quality, but as well the customer service can’t be beat! 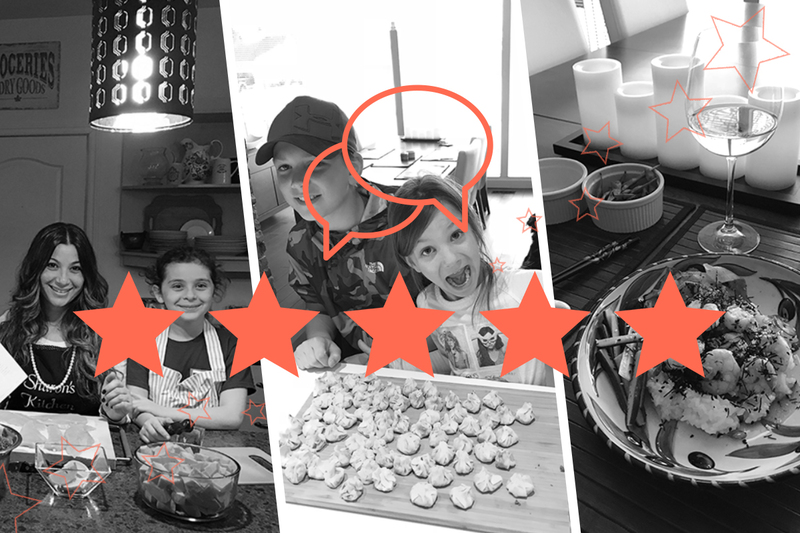 My favourite part is that my 7 and 9 year old children are able to cook dinner with me since the recipe cards are full size in colour with photos for the step by step instructions, so easy! Way to go Goodfood!! Our family has been receiving two Goodfood meals a week for nearly a month. My teenage son and daughter have been selecting and preparing all the meals. The dinners have been flavourful, varied and healthy. My kids are learning to prepare a wide range of dinners. They are building their confidence, cooking healthy dinners and developing an appreciation for the time and effort it takes to put together healthy meals. My wife and I have the added bonus of having a few nights every week where we not need concern ourselves with planning or preparing dinner. That alone is worth it! I would recommend Goodfood to any family with teenagers who are interested in cooking. I want to share that your service has been empowering. I have a new level of confidence as I no longer dread making a meal that might not turn out right. For me, to always be creative and serve new and interesting dishes at the end of the day is very difficult, yet I feel that as a Mom it is part of my job. When I come home tired, hungry, without groceries and uninspired to cook dinner, I am deeply grateful that I can reach into the fridge, follow the easy steps, and serve a delicious, nutritious meal. I love the variety and ability to choose from such great and detailed recipes. I also really enjoy learning about the different spices and produce. Because of your research, hard work, and care, I enjoy preparing dinner knowing that I am serving a quality, tasty, and ‘new’ meal to my family. I can honestly say we love every meal, which sets such a positive tone for the evening. I see my family leave the dinner table just like when they have enjoyed a scrumptious meal at their favourite restaurant, relaxed and happy. I truly cannot say enough about your company. Even on the occasion where I have had an inquiry, your member happiness team responds immediately in such a kind and professional way that you now have my loyalty. Read more member stories on Facebook, Google and TrustPilot!